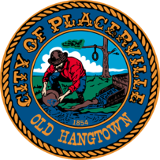 The Placerville Police Department provides Live Scan (Digital) and Fingerprint Card services for the community by appointment only. Please call to schedule an appointment. We schedule appointments for the current week. We start taking appointments on Thursdays for the next current schedule. *You may be responsible for other background fees, DOJ (California) $32.00, and FBI (National) $17.00. If your Live Scan form does not have a billing number, then you will be responsible for all fees. The appointment takes about 15 minutes, and the background is usually at its destination (requesting agency) in three to five business days.